The WHMCS module works in conjunction with FreeNAS, a free, widely used operating system specifically designed to manage backups. FreeNAS uses the ZFS file system. ZFS is very flexible and performant and offers interesting features over traditional file systems like EXT-4. For example, creating volume snapshots, fast rebuilds in the event of a hard drive failure, automatic file compression and volume scalability. That’s exactly what you need for a professional backup solution. The admin and customer area is completely AJAX based. This means that every action is performed in real time and without reloading the page. The management panel is clear and self-explanatory, so that every customer can easily manage the backup space with minimal effort. Customers can manage the storage space themselves without having to contact support. They can independently activate services, whitelist / remove IPs from access control and create, restore, delete snapshots. At the client area they can also view the access details for the activated services. In some cases you only want to offer the customer limited functions. 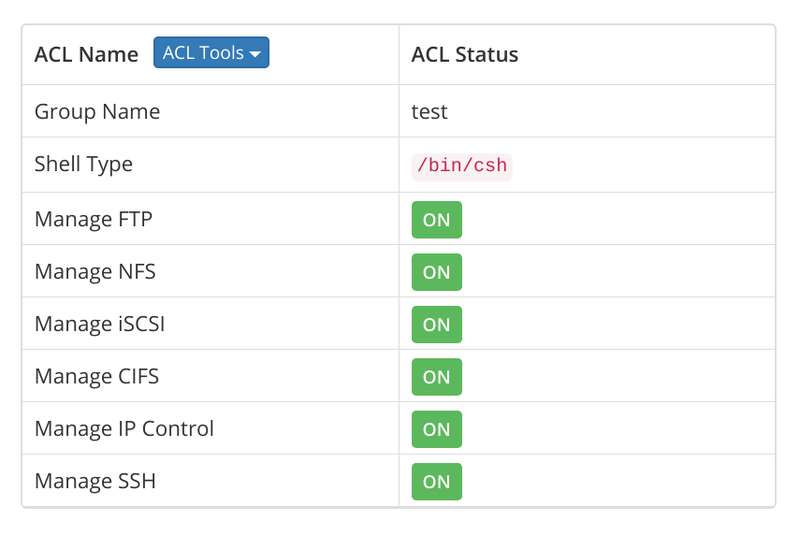 With the ACL groups, you can specify exactly what access rights the customer has. You can determine which storage access options are available to the customer, whether the snapshots can create and how many, which services should be enabled by default, and whether the customer can enable / disable services himself. Snapshots can be used to save the current state without using any additional disk space. Of course, the storage can not only be used for backups. It can be used to store web content, databases or other files. Multiple servers can simultaneously access the same storage and share the files. If the storage is used for productive content, it is quite handy to be able to save the current state of the storage and return to a previous state within a very short time if something goes wrong. Snapshots are great, and can help add value to your standard product offering! You can limit the number of snapshots per package, so customers are more likely to book more expensive packages and you increase your profits. If your client has unintentionally deleted files or something has gone wrong with their files and a snapshot exists, he can easily return to a previous point of view and restore the deleted files. In FreeNAS, you can create an automatic snapshot task. These snapshots are also available to your customers, so they do not always have to remember to take a snapshot. Your customers will be thrilled if you can offer them to recover important deleted files or undo mistakes. 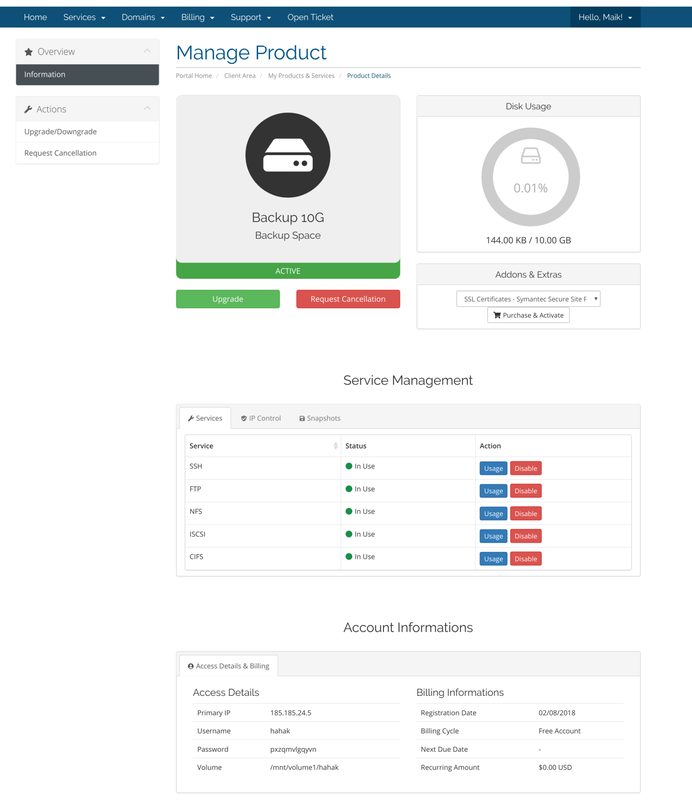 Do you want to try Backup Manager for WHMCS? For the iSCSI, NFS and Samba services, you and your customers can determine which IP addresses can connect to the backup server. The module offers you the possibility to automatically add certain IPs when activating a service. More Informations.